with others and specific materials. 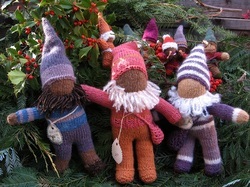 We use natural materials like wool, silk and cotton and make beautiful natural dyes. Our connection to multi-generations is evident when working together with our hands. Grandparents, parents and and friends will be inspired by students. part of my work. Sewing pajama pants and baby quilts are a couple of the endeavors we recently participated in. The spirit of imagination weaves its way through the Games and Movement program as students are encouraged to be creative in approaching every challenge, riddle, and strategy presented. My guiding principles as teacher are the four agreements: mutual respect, attentive listening, right to participate, and appreciations. The students know my rules as “Play Safe+Play Fair+Play Hard=Have Fun.” Even though I’ve played hundreds of games, I am still a seeker; I commit to continue learning and introducing new games to our students. Responses to this run the spectrum from “You’re asking us to do what?! !” to “Hmmm…” to “I can’t wait!” Children find in themselves previously-undeveloped capacities which spring forth when challenged! The SunRidge Movement program is offered to Classes 1-8 twice a week. Among the types of games played are cooperative teambuilding initiatives; problem-solving challenges; hand-eye coordination; and skill-based activities such as games involving dodging, tagging, running, skipping, throwing, aiming, balancing, and others. I’ve been successful in securing grants to procure class supplies, and constantly seek to expand the variety of materials and thus, experiences to be had. The early years (Class 1-3) focus on gross motor development, string figures and circle games, among others. The middle years (4-5) encompass games with a few more rules, coupled movements (for example, dodging while throwing), and more advanced problem solving. Classes 6-8 see more advanced games, with complex rule systems; and the most advanced problem solving and teambuilding challenges my searching mind can conjure. In addition, Class 5 is invited every year to participate in an Olympic Pentathlon gathering that requires months of physical and mental preparation. Class 6 participates in the Mayacamas Medieval Tournament, another region-wide event where students run, aim, throw, jump and generally get muddy! Class 7 adventures in the ideas of survival, blindness, and pathfinding in the Explorers’ Challenge, and in Class 8, students participate in a track meet with other schools. These culminating movement events are long-standing traditions in Waldorf-inspired schools. In addition to offering a Games and Movement program, SunRidge supports a healthy and growing athletic program. This year, many students from Classes 5-8 participated in coed volleyball, cross country, and/or basketball to great success. I’m very proud of the Movement program, Athletic program, and the students who play hard, fair and safe! Music is a large part of the SunRidge curriculum. Singing begins the very first day of kindergarten and may be heard often throughout the day. The pentatonic flute is introduced in first grade, C- flutes in second and third grades, and recorders are introduced in the the fourth grade. While in fourth grade, the children have instrumental music lessons one period per week on the violin. During the first few lessons, students practice posture and technique while focusing on creating a beautiful tone. After a few weeks, they also begin reading music. Students in fifth grade continue with instrumental instruction on the violin, or may switch to the viola or cello. Our strings instructor, Mr. Volonts, works with each child to find his/her musical voice, improving their ability and technique along the way. It is important for every student to have their own instrument and lesson books so that they can be prepared. Your pledge supports these goals for every student. 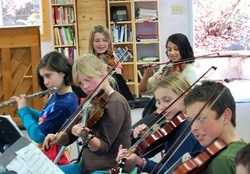 In middle school, students are offered the opportunity to participate in the Middle School Orchestra, which meets twice a week. The Middle School Orchestra is for students committed to continuing instrumental instruction. Music is chosen to challenge and inspire while teaching them how to play together as an ensemble. It is a wonderful environment for music students to improve their skills as well as experience the three pillars of music: melody, rhythm, and harmony. Playing in the orchestra allows these young musicians to realize how their sound blends with others, creating a sonic tapestry that is balanced by the teamwork and diligence of the whole group. At SunRidge Charter School we are committed to bringing hands-on garden and place based education to children from a young age. Beginning in first grade the children are introduced to the outdoor classroom and all the wonders it beholds. Abundant in story, song and educational games the weekly garden classes for first and second grade begins with the exploration of the living soil and all the important players that work to create it. With each seed sown in the garden there is a seed of curiosity sown within each child. This intrigue grows as the child moves into Third Grade and takes on the responsibility of caring for the garden with the rest of their class. As they begin a study of traditional farming societies in the classroom they are able to bring this knowledge from their heads into their hands in the garden each week in a full day in the garden. During their farm year they learn all that is involved not just in tending to a garden but in what it means to be a steward of the Earth. By the time the children move into fourth grade they’ve gained practical skills in building natural habitat for native species, composting, growing soil, seed sowing, planting, tending to wild-lands and much more. Our intention at the SunRidge Garden Program is not just to cultivate ecoliteracy amongst our students, but with this a deep respect for the Earth and all of its inhabitants. Waldorf education exercises the feeling, willing and thinking forces of a child. The will is a crucial force in the developing child. One may own an inner picture in thought and feeling, but it is through the will that it is manifested into an outer picture. With strengthened will forces, imagination can be displayed into the physical world. Our woodworking program begins in sixth grade and continues through the eighth grade. Students are introduced to hand tools as well as different varieties and densities of wood. ​In the sixth grade students are first instructed on technique and develop basic gouge techniques on a sample piece of softwood before they begin the project. They choose a hardwood to craft a unique spoon or spatula. Designing out of their imaginations, they utilize a number of tools - gouge, mallet, scraper, saw, rasp, file, chisel and various sandpapers. In the seventh grade, the students start by designing a bowl or platter on graph paper. They learn various techniques for how to make different cuts with the chisel. They learn how to use the gouge and saws to form their projects. Finishing the surfaces is done with rasps, chisels and sandpaper. By the time they enter eighth grade, they begin by designing their project on graph paper, choosing from projects such as a stool, bench, relief carving or wheeled toy. In addition to practice with the chisel, gouge, and rasp, the students are introduced to drilling, hand-planing and gluing techniques. Various finishing techniques are also utilized. Our choir program offers 5th - 8th grade students a vibrant choral learning environment, featuring a varied repertoire of folk, popular, and classical songs. Students also improve their musical literacy through the kodàly method of reading and writing music. The choral program works together with the grades' curricula to enhance learning and a deeper understanding of music in community. Above all, our program aims to develop a love for music and singing together within our students. From the inception of the first school, Eurythmy has been an essential part of the Waldorf school curriculum. The roots of the word come from Greek: eu = harmonious; rythmos = movement/rhythm; hence, eurythmy means harmonious movement. Eurythmy takes as its inspiration the elements of speech and music -- conveying the world of nature, culture, and the human soul and spirit. Our inner and outer lives, our imaginations, thoughts, feelings and activities, are all a continual flow of movement. These movements are educated, harmonized, and strengthened through the practice of Eurythmy. The curriculum, offered in Kindergarten through Third Grade at SunRidge, follows the wisdom of the students’ physiological, emotional, social, and cognitive development in such a way as to assist in the unfolding of a healthy human being. Our Spanish program is offered in grades 4th-8th.